Cambria (pronounced cam bree uh) is a cute little town, filled with interesting shops, restaurants, and its streets lined with lovely gardens. It's a fun place to go all by itself, but it's also a convenient base for visiting Hearst Castle and the coast around it, from Morro Bay up to Ragged Point. Cambria is a good place for a romantic getaway if you like bed and breakfast inns. 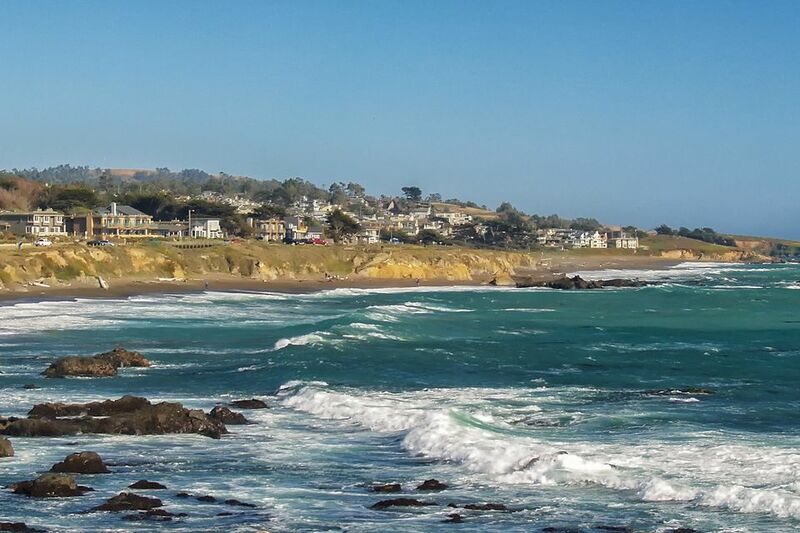 Just across Highway One from downtown Cambria, you can find some almost-beachfront hotels at Moonstone Beach. Downtown is perfect for a hand-in-hand-stroll and so are the nearby beaches. Like much of the California coast, Cambria's Moonstone Beach is likely to be overcast all day long in June and July, but the town is just far enough from the coast to be sunny even when the beach is not. Of course, this means it's also crowded in summer. After the end of summer, the skies clear up, and hotel rates go down and stay low through spring. Moonstone Beach is the best place in town for natural beauty: crashing waves, surfers, tide pools and driftwood-strewn sand. It's easily accessible by almost anyone, with a level boardwalk just above the beach and a smooth route down to the sand's edge. Get some picnic supplies in town and enjoy them while watching the waves crash in, or settle on the patio at Moonstone Beach Bar & Grill across the street and see the sunset. Don't miss the Elephant Seals: The elephant seal rookery next to Highway One about 4.5 miles north of Hearst Castle is most interesting during the breeding season, from December through February when almost 4,000 pups are born in just a few weeks. If you like to shop, make downtown your first stop. Gallery shopping: Stroll down Main Street and up Burton Drive, browsing as you go. Don't let appearances fool you - Main Street takes a little break around Cambria Drive, but it's lined with shops on both sides of there. Learn lawn bowling: Cambria Lawn Bowls Club (950 Main Street) offers free lessons Monday, Wednesday, and Friday. Visit a real Nitt Witt: Built by reclusive artist Art Beal, this folk art wonder call Nitt Witt Ridge is open for tours (reserve ahead). Visit Hearst Castle: A half-hour drive north of Morro Bay; Hearst Castle is the area's most popular attraction. It will take you nearly half a day by the time you see the film and take a tour. Piedras Blancas Lighthouse tours: Located just 15 miles north of Cambria, you can tour this historic lighthouse, first illuminated in 1875 to guide mariners along the rocky California coast. If you're wondering where its light tower went, the Fresnel lens is on display in downtown Cambria. October: During the annual Cambria Scarecrow Festival, more than 350 of the cutest, most creative scarecrows you can imagine line the town's streets. Spring and fall is the time for Hearst Castle Evening Tours. Hearst Castle comes to life at night. Warm lighting and docents in 1930s costumes—women sipping martinis over their card game, reporters typing their days' stories in their bedrooms and lovers strolling the grounds—bring the massive house alive. In summer, make your reservations as far in advance as you can. The nicest properties fill up fast. No matter when you visit, the Cambria Village Trolley makes it easier to get around town. If you need a restroom, you'll find public facilities on Burton Street, just off Main Street. Two of Cambria's long-standing best restaurants are the Sow's Ear and Robin's, but Moonstone Beach Bar & Grill has the best views in town. You can use your favorite app to find the best newcomers in town. Most of the bed and breakfast inns are in town, but you'll find small hotels along Moonstone Drive. While none of them are right on the beach, most are just across the road, close enough that you can smell the spray and hear the crashing waves. To find your perfect place to stay, read up on tips of where to stay, compare hotel prices, and check out local campgrounds. Cambria is halfway between Los Angeles and San Francisco, on California Highway 1 between Morro Bay and Hearst Castle. It's 290 miles from Sacramento, 125 miles from Monterey and 425 miles from Las Vegas. If you take Amtrak to San Luis Obispo, you can catch the Ride-On Service that will take you right to Cambria. But getting to anywhere else in the area from there can be difficult.